Find a great sale price on this 2019 Ford Edge Titanium at Value Ford in Elma Washington. This 2019 Ford Edge Titanium is located at our Ford dealership in Elma. We also serve the cities of Aberdeen, Montesano, Tumwater, Hoquiam and Olympia. 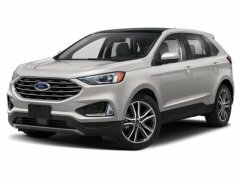 So if you're looking for a great price on this 2019 Ford Edge Titanium or just looking to get an auto loan for the vehicle you want... you've come to the right place! Value Ford. Listed sales prices include all standard Factory to consumer rebates such as: Retail Customer Cash, Special Customer Cash, Bonus Cash, Ford Credit Bonus Cash (Must finance through Ford Motor Credit to receive, on approved credit), Trade-In Assistance Cash and Other Bonus Cash. Other rebates may be applicable such as: College Grad Cash, Lease Conquest Cash, etc. See Dealer for complete details and qualifications. Not all customers will qualify for Ford Motor Credit financing. Moonroof, Nav System, Heated Leather Seats, Premium Sound System, All Wheel Drive, Back-Up Camera, Power Liftgate. White Platinum Metallic Tri-Coat exterior and Cognac interior, Titanium trim. FUEL EFFICIENT 28 MPG Hwy/21 MPG City! SEE MORE! KEY FEATURES INCLUDE All Wheel Drive, Power Liftgate, Back-Up Camera, Premium Sound System, Satellite Radio, iPod/MP3 Input, Onboard Communications System, Remote Engine Start, Dual Zone A/C, WiFi Hotspot, Lane Keeping Assist, Smart Device Integration, Brake Actuated Limited Slip Differential, Blind Spot Monitor, Hands-Free Liftgate Rear Spoiler, MP3 Player, Keyless Entry, Privacy Glass, Remote Trunk Release. OPTION PACKAGES EQUIPMENT GROUP 301A Adaptive Cruise Control w/Stop & Go, Front 180 Degree Camera, split view and camera washer, Voice-Activated Touchscreen Navigation System, pinch-to-zoom capability, SiriusXM Traffic & Travel Link, a 5-year prepaid subscription, Services are not available in Alaska and Hawaii, SiriusXM audio and data services each require a subscription sold separately, or as a package, by Sirius XM Radio Inc, If you decide to continue service after your trial, the subscription plan you choose will automatically renew thereafter and you will be charged according to your chosen payment method at then-current rates, Fees and taxes apply, To cancel you must call SiriusXM at 1-866-635-2349, See SiriusXM customer agreement for complete terms at www.siriusxm.com, All fees and programming, PANORAMIC VISTA ROOF power open/close w/power shade, Deletes standard silver roof-rack side rails, Standard 2nd row LED dome light is replaced w/2 single lights, Switch located in each grab handle pocket WHY BUY FROM US Spring Clearance Sale On Now! Call Or Click Today! New-Advertised sale prices are after all factory rebates including retail customer cash, special customer cash, bonus cash, ford credit cash, trade assistance cash, and other bonus cash. Customer may qualify for additional incentives.